@Arab Street | Get Your Grub On! One of my visitors fell in love with the ‘Dan Dan Mian‘ from ‘Hong Guo‘ in Chinatown but since she had to leave on Monday night, when they are closed, and today was Sunday, when they only do dumplings, I was looking for some new alternative. 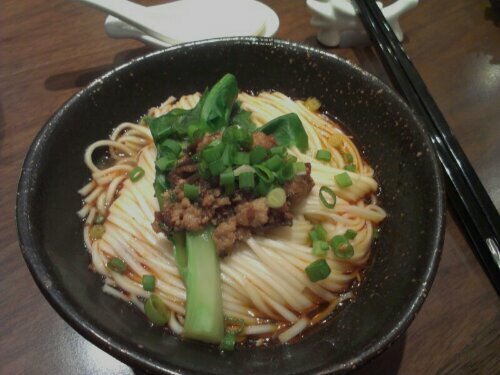 On a fellow blogger’s site I found two restaurants that he or she called the best for ‘Dan Dan‘ noodles in Singapore – ‘Si Chuan Dou Hua’ in the Old Parkroyal Hotel on Beach Road and ‘Silk Road‘ at the Amara Hotel in Tanjong Pagar. 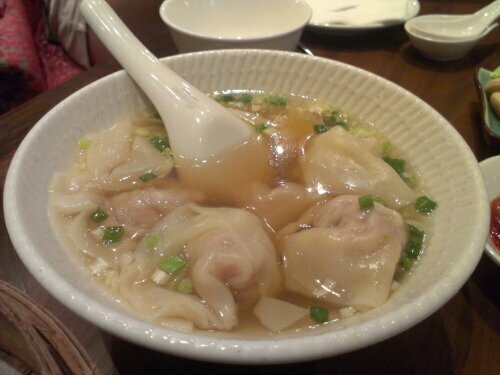 Due to convenience and laziness we chose ‘Si Chuan’ simply because it was closer to home and we did right with it. The place has a tea house ambience without the fridge like coldness of many Chinese restaurants here. Our waiter was a bit reserved at first but every time she came back to our table she became visibly happier and smilier. We ordered the ‘Dan Dan Mian‘ (6$), the ‘Xiao Long Bao‘ (XLB) here called ‘Steamed Minced Meat Dumpling in Superior Stock‘ (4.5$) and the not steamed ‘Minced Meat Dumplings in Superior Stock‘ (6$). The noodles looked delicious and were nicely presented in a pottery bowl but unfortunately were cooked a tad over my preferred al dente. Nevertheless they tasted great, not too spicy but full of sichuan pepper flavor covered with a light chili oil and just a hint of sesame. The minced meat and mushrooms enriched the dish and made it quite filling even that the portions weren’t too overwhelmingly generous and for a texture change the baby kaylan did a great job. Another great surprise were the ‘Xiao Long Bao‘ with superior stock. They come only in threes but delicious threes. For XLB they were quite big but mainly because of the huge amount of soup inside and the meat was very finely minced and tasty. Visually they were almost perfect; enough folds, transparently thin dough so the soup could shine through and on the bottom a razor blade thin slice of carrot preventing the baos to stick to the paper. Odd but something different and since it didn’t taste like anything I didn’t mind it. The stock truly tasted superior and there was plenty of it too. I later regretted not to have ordered more of those but the place, even that nearly empty, wasn’t the fasted so we refrained from any second rounds. After all those tasty dishes the soup dumplings came across boring and bland. Presentation, quality and texture were fine but that doesn’t help if the food itself has no taste at all. On my next visit I rather have more of the XLB or try something new. Finding new places with really great food always makes me really happy and ‘Si Chuan’ surely made my list for top ‘Dan Dan Mian’ places to go. Thanks ‘Foodie-ah’, good one.